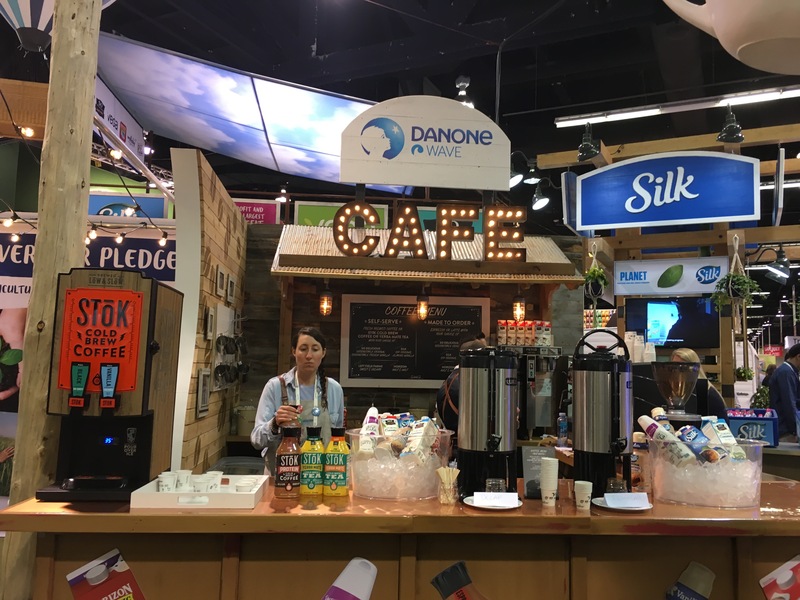 With all of the moving parts in your tradeshow marketing program, there is one area that stands out above all the rest as being critical to your success – how to break the ice and engage tradeshow visitors. And since this is a compelling question that needs concrete answers, I thought it worthwhile to bring in one of the pros at tradeshow engagement, Andy Saks of Spark Presentations. Andy has been training company booth staff in the art and science of engagement for years. I thought it would be an easy thing to have him share a few questions that he teaches his clients about how to engage, but it’s much more complicated than that! Of course it is. As Andy describes it, booth staffers often walk into a booth shortly before the show begins, seeing it for the first time, and it’s a beautiful piece of branding that the company obviously spent a lot of time and money on. The booth is MUY IMPORTANTE, which immediately makes the staffers feel like they’re there to support this awesome booth and company. But it’s not necessarily the way it should be. “The booth is there to support you, not the other way around,” said Andy. Without training, a booth staffer often feels like they are there to field questions and direct traffic. 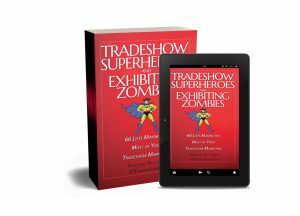 But a properly trained staffer who understands the situation – fully understands the entire scope of appearing at a tradeshow to gather leads and convert them into a customer – has a better understanding of how to approach engagement. Which will result in more leads and more business. Everything you do in a booth, from eating, talking on a cell phone, standing with your arms folded, sitting in the back of the booth is sending a message to prospective clients that you’re trying to reach, and the message is: we’re not ready for you, please go somewhere else. So all that money spent on the booth and on staff travel and lodging is then wasted on that prospect. DO Stand around the edge of the booth, within a couple of feet of the edge of the booth. DO Stand alone, not in a group of people (which is intimidating). DON’T be holding anything that the attendee might consider a potential distraction. DON’T be drinking coffee, which sends a message that you’re not at 100%. DO be smiling, and really making a concerted effort to smile and put on your best face. Now that you’ve made yourself the most appealing thing at that moment, you move to the QUALIFYING stage. The goal is to ask smart, qualifying questions to build a personal rapport of trust and also reveals their pain. “How’d you get started in your job or this industry?” The attendee will regard this question as a sign of your interest in them. Most people, as adults, are not doing what they thought they’d like to do as a kid. By asking this question, it recognizes that somewhere along the way, they took a left turn from their intended or desired career to get where they are now. People like to talk about themselves, and a question like this will reveal a lot of things that may be important. Other staffers in other booths tend to focus on product benefits, company marketing bullet points – in other words, it’s all ME ME ME, and if you ask about THEM you have made an impact. You have made yourself memorable. As you get a couple of minutes into the conversation and you’ve uncovered that they may be using a competiting product, ask a COLLECTION question, such as, “What would you change about your current product if you could?” The tradeshow floor is a tremendous opportunity for market research, and if you’re in the midst of a one on one engagement, you can uncover elements of how they use that product. In fact, they might list the top three or four things about that product that they’d like to change – stuff they don’t like. In this instant, you have someone who is a user of your competitor’s products, telling you specific things that they don’t like about that product. Can you imagine having that conversation 10, 15, 20 times a day and what market research would come from that? That’s when you can say, “Well, just so you know, our product does such and such and solves those problems, so if you’re ever in the position to switch, we’d be glad to talk to you.” You’ve planted a seed that may help them grow into a client. As Andy put it, when you’re saying this to the attendee, you’ll hear your voice and all of the noise of the tradeshow floor, but the attendee will hear angels. Because somebody on a tradeshow floor listened to them! The sale is nearly 90% complete in this moment. All other details, like size, delivery options and so on can be worked out. Your tradeshow booth staff is the front line. 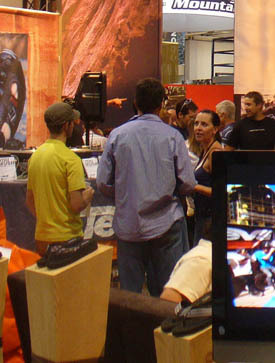 They represent your company from sunup to sundown in every moment on the tradeshow floor. How they represent you may be the difference between winning that big client or distributor for your product. If they don’t know how to engage attendees properly, you may not even know what you missed. Andy Saks, Spark Presentations, excels in tradeshow presentations and tradeshow training for booth staff. Check out his page and the fun video. You’ll no doubt learn something very worthwhile!